Select an option below for more specific details on how we can be of service to you. We understand the challenges you face with the complexity in our tax system and constant change in our business and legislative environment. That is why we’lll provide you with quality advice and superior service that is clear, easy to understand and implement. Mohr Solutions is a CPA Australia practice that will assist you in achieving your business, career and personal goals including planning for retirement. We’re a family owned business with two core traits that drive everything we do. These two traits are Quality and Service. With Mohr Solutions, we believe that your expectations will be surpassed as you experience high quality and superior service in all that we do. 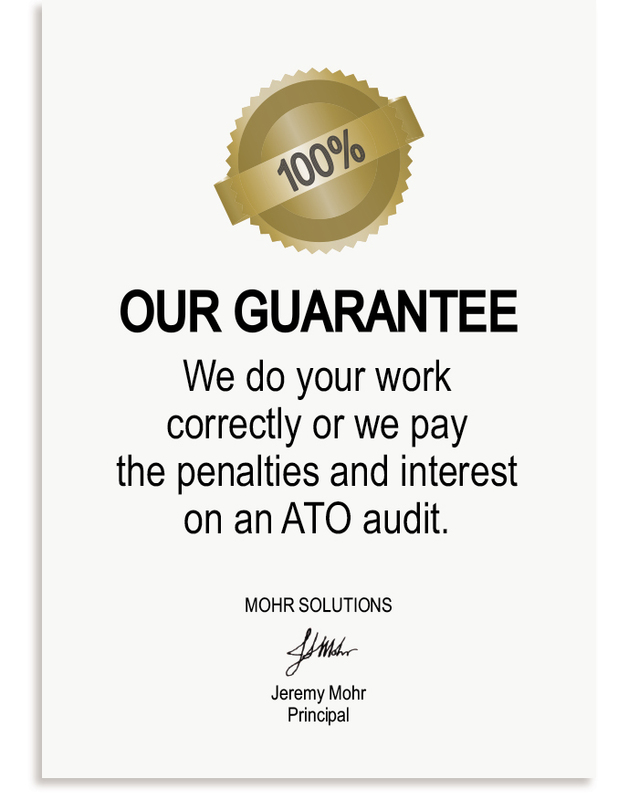 Our Guarantee: We Do Your Work Correctly Or WE Pay The Penalties And Interest On An ATO Audit. send us an email or complete the enquiry form below. We’re delighted to meet you.